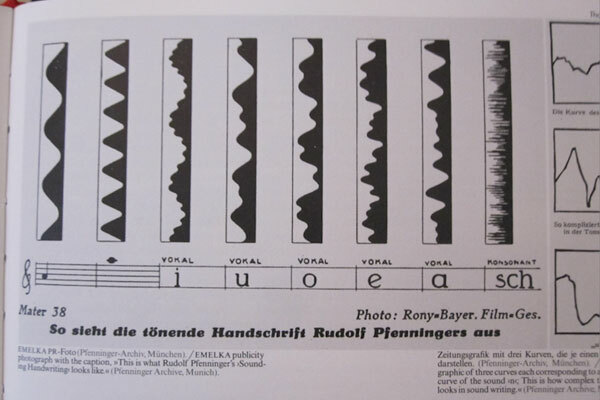 Pfenninger, an engineer and animator, arrived at a system of synthetic sound before Fischinger, one that held different ramifications for the understanding of film sound. After many years of radio and sound experimentation, Pfenninger developed a system of what he called "sounding handwriting" in 1929. Using an oscilloscope, Pfenninger was able to assign a unique graphic representation on a twelve-by-one-inch strip of paper to any tone that was produced. Each paper strip (again, one for each note) was then photographed onto the optical soundtrack. In 1930, he showed two of his animated films that utilized the technique, exhibiting a full-scale film program two years later. While Thomas Levin reports that some critics at this later screening thought Pfenninger's sonics were "mechanical" or "soulless," others found them "magical." While the majority of those on hand seemed impressed by the work on a technical level, others questioned whether or not the soundtrack was music--or the future of music.